Former Guantánamo detainee Moazzam Begg will speak at this weekend’s Social Forum Cymru in Aberystwyth, it has been announced. Social Forum Cymru tales place in Aberystwyth from 28 April to 1 May. I wrote a piece for this week’s Big Issue on the controversial geologist John Mackay who is visiting Wales. He is the head of a creationist movement and believes there is evidence for the biblican flood in the Earth’s crust. They are controversial views, ridiculous or fantasy to many of us, I’m sure, but are they really “dangerous” and “intellectual child abuse” as I saw one newspaper describe them this week? Does everyone we disagree with have to be labelled a dangerous extremist now? 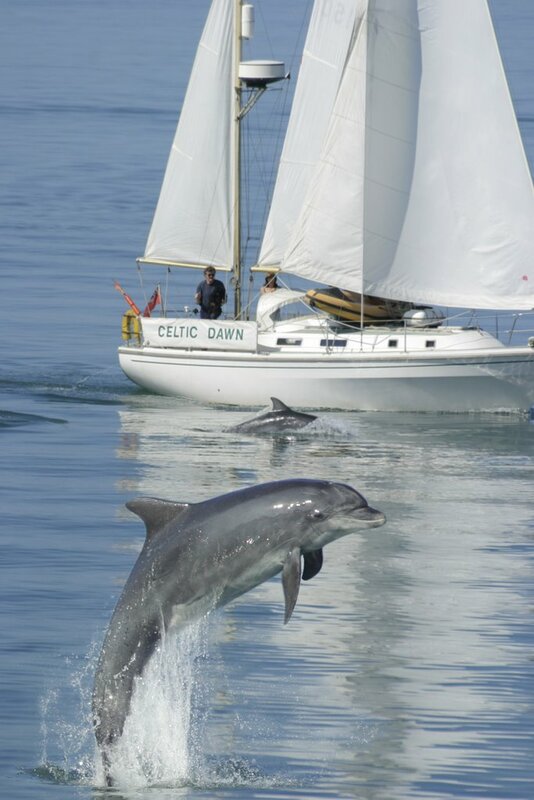 This rather heartwarming photograph was sent to me by Ceredigion County Council on an email about its Dolphin Watch scheme which ensures boat users take care around marine wildlife. I thought it was something to brighten up this rather grey Bank Holiday morning. Marie Walsh’s job is all about avoiding conflict but she is heading for a showdown with the Government. The mediation teacher from Blackwood has refused to pay ten per cent of her income tax. She began her protest in January 2003 and has so far withheld £134.45 on the self-employed part of her earnings. In February the Inland Revenue threatened her with court and she risks jail if she continues to face down the tax man. The Revenue also has the right to seize personal property if she does not cough up, but the money is not there. She has already passed it on to a number of peace organisations, including CND. This is no common tax dodge then. The 49-year-old started with-holding the cash at the time of the war on Afghanistan and has continued throughout the invasion of Iraq. Her actions highlight a dilemma for many, particularly as we are all conscribed to our Government’s wars through its access to our hard-earned cash. (About ten per cent of our taxes contribute something like £37bn a year to war). In fact, only a few weeks after Marie started her protest an early day motion was laid before MPs. It recognised the “increased distress felt” by many on being “forced to contribute through their taxes to military activity”. The motion asked the Government to find a way in which people who objected to war could ensure the “military part of their taxes” could be spent on “peace-building initiatives”. It was signed by 20 MPs, including a number from Plaid Cymru. Tax resistance came of age in the United States during the Vietnam War when the US government acted like some medieval king preparing to take his armies abroad and reintroduced a special war tax. It was added to phone bills, but eventually half a million Americans were refusing to pay it. The Hang Up On War campaign continues, with thousands ignoring the surcharge which became permanent under George Bush senior (and now raises about $6bn a year). Each protester like Marie Walsh risks a knock from the bailiffs. But what other options do they have in our supposed democracy to stop being co-opted into the killing? Aren’t their individual acts of disobedience now the only way to back up the Not In My Name rhetoric with Not With My Money defiance? To govern is to choose on behalf of the people and to accept responsibility for your actions. Not one British politician has done that, even though Iraq is now an occupation of a largely unwilling population by largely unwilling armed forces. Instead politicians distort the truth and shift the blame in ways which would get most of us the sack. They thrive safe in the knowledge that all we – the voters – get is a single X on a piece of paper every five years. Did you honestly believe – even before the furore over cash for coronets – that scrawled X offered you the same handle on power as a CEO of a multinational, a city banker or a newspaper owner? No major Westminster party really opposed the Iraq invasion (don’t be caught out by the Lib Dems’ vomit-inducing, opportunistic, con trick on that one, questioning the action but then supporting it once the killing started) so what real choices are there? Why shouldn’t one take some power back for one’s self? The Government wants the pound in our pockets so withholding it might be one of the few weapons of mass disruption we have left. It’s all very well to understand the rottenness of the world we live in. The point, a philosopher once said, is to try to change it. Marie at least can say she saw what was wrong and she did her small bit to make a difference. The couple who were jailed for killing a three-year-old boy by giving him a “salt overdose” have won their appeals against conviction. Lawyers for Ian and Angela Gay had asked the Court of Appeal in London to accept evidence that toddler Christian Blewitt – who they had planned to adopt – could have died of natural causes as a result of a type of salt diabetes. Three judges today quashed their convictions and ordered a retrial. I wrote about the possibilities that the Gays were innocent in the Western Mail last year and later added the article to my blog. Ian Gay, 39, and his 40-year-old wife, from Halesowen, West Midlands, were each jailed for five years in January last year for manslaughter following a seven-week trial at Worcester Crown Court. Christian died in hospital four days after being found unconscious in his room on December 8, 2002, at the their house. * Not that it is important in the context of this tragic case but it is not true that Angela Gay is originally from Merthyr. This appears to have been a mistake made at some point in the early reporting of this case and repeated a number of times in the belief that it was correct. I believed it to be true as well, but was corrected in a polite letter from Mrs Gay from her jail cell.